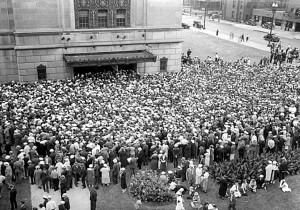 Mourners outside Memorial Auditorium in downtown Minneapolis, August 26, 1936. 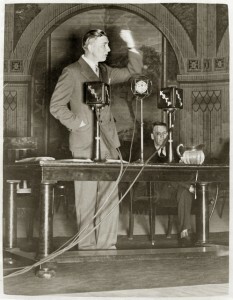 Image from the Minnesota Historical Society. Mourners massed in the Municipal Auditorium to commemorate Olson’s legacy. 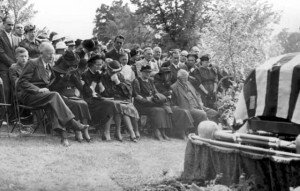 A more intimate group gathered at Lakewood Cemetery to lay him to rest in a glass-topped coffin. During that hot summer week, the city gave itself to bereavement. 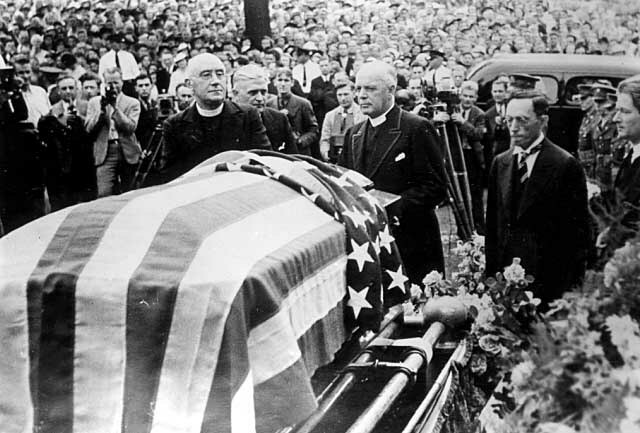 But not everyone was as sad as the motorman–or Sevareid– to say goodbye to the 44-year-old governor of Minnesota. The populist politician was reviled by many who saw him as a ruthless demagogue who had served at the behest of the city’s crime bosses. 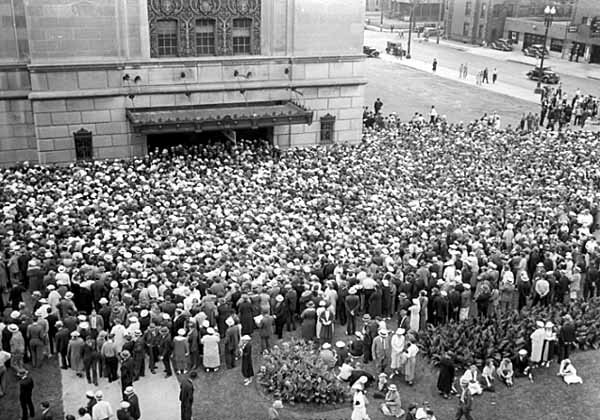 The son of Scandinavian immigrants, Olson had grown up on the near North Side of Minneapolis, surrounded by Jewish and African-American neighbors. He was trusted in the neighborhood as a Shabbos Goy, a person employed by observant Jews to light candles and do other household tasks on the Sabbath, when they are forbidden to do any kind of work. Olson’s father had steady work on the railroad that kept his family out of poverty. But his home was located in a quarter of the city viewed by many as a terrible slum. In fact, the year after his death, his block was bulldozed in one of the city’s first effort to clear urban blight; this became the site of the Sumner Homes, the first federally funded housing project in Minnesota. Birthplace of Governor Floyd B. Olson, razed for Sumner Field Homes. The city published this image in the newspaper to show that “even governors’ birthplaces can be fire hazards.” Image from the Special Collections Department of Hennepin County Library. Olson spent a desultory year at the University of Minnesota. Then he drifted around the continent working as a longshoreman, miner and harvest hand. He returned to Minneapolis to study law and by 1920 was Hennepin County Attorney. Over the decade that followed, his career as the county’s top law enforcement man bore the stamp of his formative years in one of the most diverse neighborhoods in Minnesota. Olson was keenly aware of the dangers of the Ku Klux Klan, which was attracting a popular following in Minneapolis in the early 1920s. He used his position as Hennepin County Attorney to expose the secret white supremacist organization. 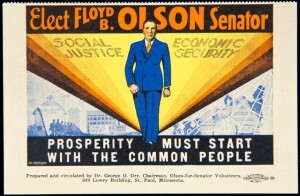 Olson’s successful crusade earned him the sustained support of the city’s Jewish community as well as emerging African-American activists like Lena Olive Smith, who would later lead the city’s NAACP. Olson was no advocate of Prohibition. And to be effective in Minneapolis politics in the 1920s, he needed to be able to work with its powerful criminal elements. But his most troubling flaw, in my opinion, was his opposition to a free press. He worked to silence those who linked him to the city’s underworld. And he even made a personal appearance at the Minnesota Supreme Court to champion a law that gave the state right to suppress publications viewed as undesirable. He argued that “freedom of speech is not an absolute right”; this logic was rejected by the United States Supreme Court in 1931. The ruling did little to protect reform-minded writers; three Minneapolis journalists were murdered between 1934 and 1945. Critics castigated Olson for refusing to pursue the killers in the first two cases. 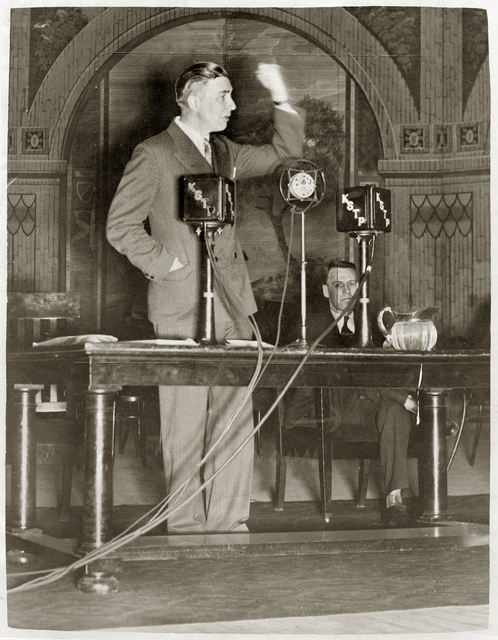 Image is from the Minnesota Historical Society. 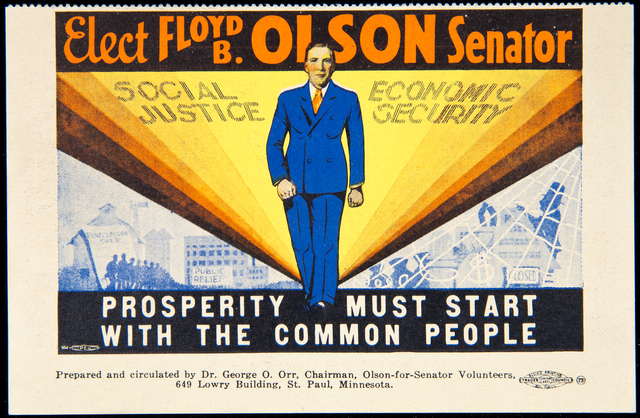 Olson could be remembered as the Paul Wellstone of his time, a populist political maverick silenced by tragedy at the apex of his influence. But Olson remains a cipher to me. It is impossible to predict the kind of leader he would have become with the end of the Great Depression and the onset of World War II. This is food for thought during a drive down Olson Memorial Highway, through the neighborhood that helped to shape the young politician into one of the most complex figures in Minnesota political history. Material from this post was taken from Eric Sevareid, Not So Wild a Dream (New York: Atheneum, 1976):. 71-72; George Mayer, The Political Career of Floyd B. Olson (Minneapolis: University of Minnesota Press, 1987); Marda Liggett Woodbury, Stopping the Presses: The Murder of Walter W. Liggett (Minneapolis: University of Minnesota Press, 1998); “Murder in Minneapolis,” The Chicago Tribune, February 2, 1936; “Lena Smith Among Governor Floyd Olson Supporters,” Twin Cities Herald, November 12, 1932; Floyd B. Olson House, National Register of Historic Places Inventory Nomination Form, 1914 West 49th Street, Minneapolis, December 31, 1974.